Charles Howell was able to share this win with his family. 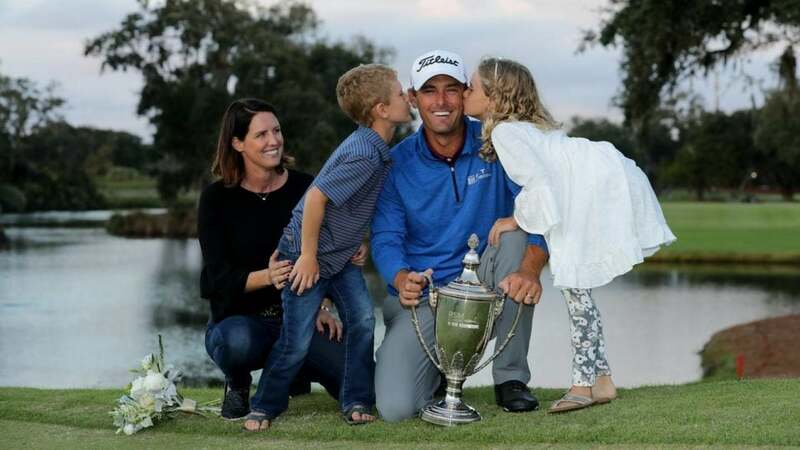 When Charles Howell III's winning putt caught the right side of the cup and fell in, the 39-year-old fell to his knees and buried his head in his hands. After a drought of more than 11 years, Howell is a PGA Tour winner again. What was he feeling in that moment? "All the emotion of the 11 years," Howell said. He opened up on just what it all meant post-round, echoing remarks made by Lee Westwood and Matt Kuchar just a week prior. Kuchar and Westwood hadn't won since 2014. Howell? Not since 2007. There were doubts, he said, questions he himself had about whether he'd be here again. Charles Howell's last win came at the 2007 Nissan Open. "It's been 11 years since I've won a golf tournament and quite honestly, I didn't know if I would ever win one again for the obvious reasons that I had come up short so many times and the fact of how the game is changing," Howell said. He was referring to years of frustrations, near misses, close calls. And he was referring to changes in the form of Cameron Champ, who played alongside him on the weekend. "I just spent 36 holes with Cameron Champ, who hits a 3-iron 290 yards off almost every tee and it gets your attention how golf's changing," he said. But no matter; Howell wound back the clock and notched his first win since the Nissan Open in 2007. Howell was a blue-chip prospect from the start. He won the NCAA National Championship in 2000 for Oklahoma State. In 2001, he won PGA Tour Rookie of the Year. In 2002, he won for the first time on Tour. His second win, at the Nissan in 2007, took surprisingly long to come through. He was afraid the third would never follow. On Sunday, it finally did. "You know, golf is a brutal game and with the highest of the highs, it comes with a lot of really lows. You know, you work and then you practice and you prepare and you think you're doing all the right things and the results don't quite show that. So then you start to question everything really. You know, just -- it's a wonderful lesson to be learned that if you truly believe in what you're doing, to stay the course." https://twitter.com/PGATOUR/status/1064276677834895360 There were plenty of doubts on Sunday, too. Though he entered the day with the lead, Howell started bogey-double and considered the idea that his chances at the title were already slipping away. "I just honestly thought I had shot myself in the foot again," he said. Plenty comes with a Tour win. For starters, there's a trip to Hawaii in January. "I haven't been back to, what is that, the Sentry Tournament of Champions since it was four sponsors ago, so it's been a while. But no, I'm thrilled to get back there," Howell grinned in the post-round presser. Another side that made the win so rewarding? Howell was able to share this with his two children. "It means a lot because they're now of the age than they know what's going on," he said. His son is a particularly avid follower. "He follows the PGA Tour app more than I do, he knows the FedExCup standings and the world golf rankings, his favorite golfer is Justin Thomas," Howell said. There's one more thing, too: an invitation to Augusta National for this year's Masters. That's particularly meaningful to Howell, who grew up just miles from the course. "That tournament, that atmosphere, just everything, it's tough at home to sit back and watch that on television. So to get back there, it's funny, that's one of the first things that popped in my head, was getting back to the Masters." Golf can be brutal, Howell acknowledged. While he loves the individualistic nature of the sport ("it's all on you, it's all on the player," he said) that can be a double-edged sword. "What I hate about it is that you can work and work and work and get absolutely no results from that," he said. "You can speak to any Tour player out here past or current and I think they would tell you the same thing, that you can go down a rabbit hole and work and work and work and literally on the back end nothing come out of it." But that wasn't the case for Howell on Sunday evening, in the long shadows at Sea Island. He'd earned his payoff. There was the $1.2 million winner's check; that was nice, even for a guy with more than $35 million in career earnings. But the win itself meant far more. "I couldn't believe I did it," he said.